Yahoo has extended its sustainability strategy at its Quincy, Wash. data center to weed control, with the help of a herd of grazing goats. 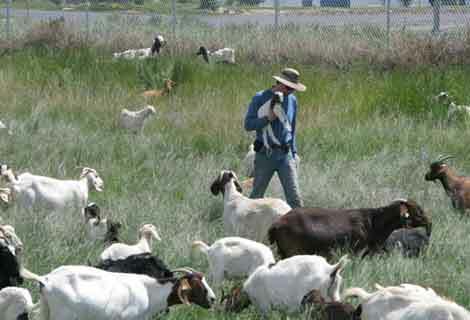 A herd of goats provides a green alternative to traditional mowing or use of pesticides to control weeds at Yahoo! data center facility. Most initiatives to make data centers greener focus on measures to reduce power and cooling usage. But Yahoo has extended its sustainability strategy to weed control, with the help of a herd of grazing goats. The Yahoo data center facility in Quincy, Wash., is located exactly halfway between Seattle and Spokane along the Columbia River in an area of the country with rich farmland. Despite the beauty of the rural setting, the data center had an issue with invasive weeds in an adjacent pasture. "We opted for a creative - and greener - alternative to spraying the weeds with pesticides," says Christina Page, Yahoo Director of Climate and Energy Strategy. "We enlisted the help of Craig Madsen from Healing Hooves, and his herd of 252 goats to come visit for a few days. Goats eat just about anything, and it turns out, they find weeds particularly tasty, preferring them to the non-invasive grasses on the land." See a video of the goats doing their job. The goats and their herder live a few hours away in Edwall, WA and typically take up residence at the Quincy data center property for two or three days several times a year, depending on the weather and how fast the weeds are growing. Their next visit is expected in July. It seems the goats have become part of the team. 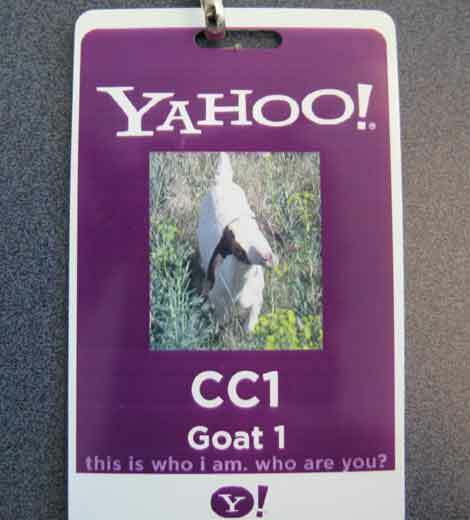 "In the spirit of one Yahoo!, we provided the goats with their very own security badges," says Page. Guess the goat has security clearance now. It turns out goats aren't just good for data centers. Both Yahoo and Google have used herds of goats to control brush and weeds at their Silicon Valley headquarters campuses.